Today, 22 is the magic number. Not only does it represent Joyous Celebration’s 22 recorded albums, it is exactly 22 days to the Carnival City launch event, and 22 days until Easter weekend. In addition, the album debuts… you guessed it… at #22 on the Apple Music Gospel Chart! What better timing, for the worldwide release of the highly anticipated live recording – Joyous Celebration 22: All For You! 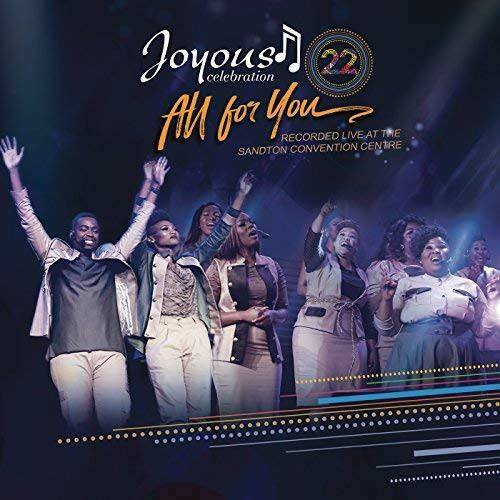 With a No.1 debut today on the iTunes Gospel Album Chart and No.3 position on the main iTunes Album Chart – Joyous Celebration 22: All For You is evidently not only in high demand on streaming and download platforms – given the DVD hit Gold sales milestone, hours into release day. The Multi-award winning gospel powerhouse recorded Joyous Celebration 22: All For You live at the Sandton Convention Centre in Johannesburg on 09 December 2017. Through hard work, dedication and sleepless nights Joyous Celebration has yet again given their fans their long awaited 3CD and 2DVD sets – promising to move fans into praise and worship from the first song to the last. When asked about the chosen theme and title All For You Pastor Jabu Hlongwane responds saying – “We do this every year and this year the album was made for the fans – hence the title All For You”. In keeping with the title All For You, the first single and album opener, Umoya Kulendawo transports listeners to the nostalgic roots of early Joyous Celebration recordings. The first single, which has maintained the Top 10 chart position on iTunes was followed by second single Modimo Ke Lerato which has been received equally well by fans. “We chose these two songs as singles due to the response they have received at our live shows, so we thought we would do something that we have never done before which was to release two singles ahead of the album release” says Jabu Hlongwane, co-founder of Joyous Celebration. Joyous Celebration 22: All For You is produced by Lindelani Mkhize, Mnqobi Nxumalo and Sphiwe Ngcobo.